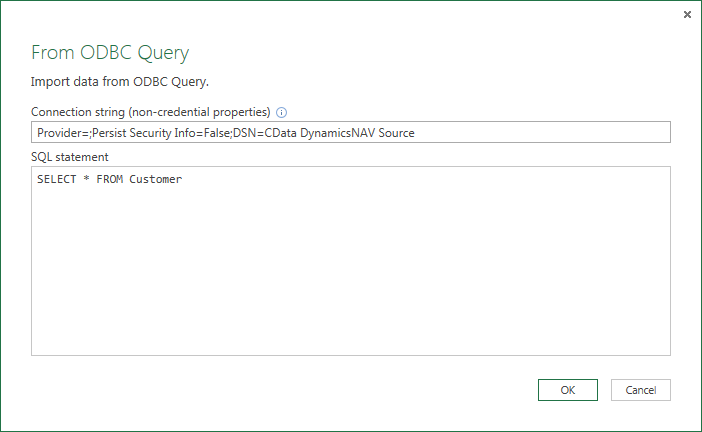 Read this tutorial to learn how to securely visualize your Dynamics NAV data in Power BI using the CData ODBC Driver for Dynamics NAV. The CData ODBC Driver for Dynamics NAV provides a streamlined, secure way to visualize your Dynamics NAV data in Power BI. The CData ODBC Driver for Dynamics NAV links your dashboards and reports to the live Dynamics NAV data. By scheduling refreshes and refreshing on demand, you can create dashboards that reflect changes to your data in real time. This article details how to use the ODBC driver to create dashboards featuring Dynamics NAV data in the Microsoft Power BI Designer. Follow the steps below to connect to Dynamics NAV data, create a visualization, and interact with it in the Editing View. You can configure the DSN in the built-in Microsoft ODBC Data Source Administrator. This is the last step of the driver installation. See the "Getting Started" chapter in the help documentation for a guide to use the Microsoft ODBC Data Source Administrator to create and configure a DSN. 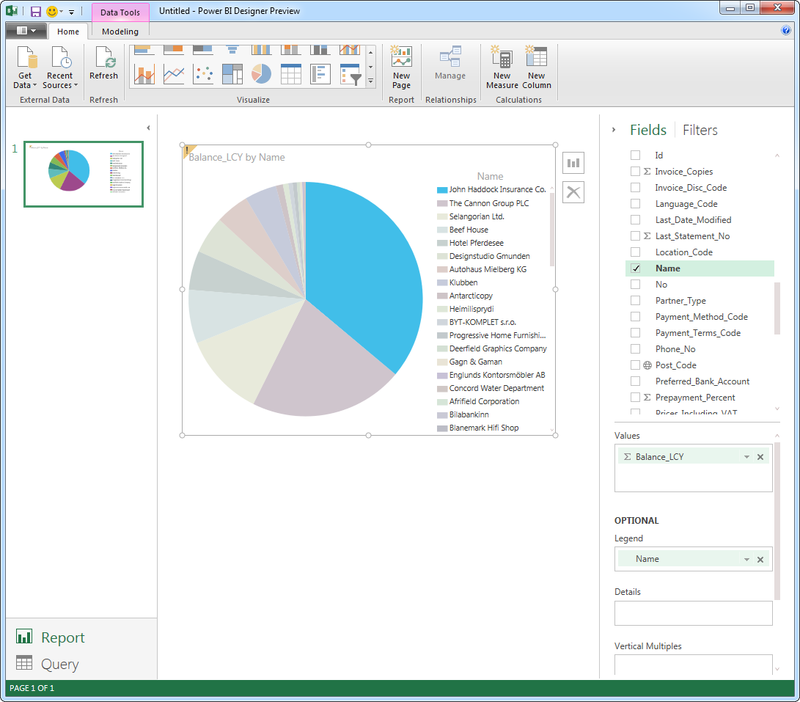 Open the Power BI Designer and click Get Data. To start the Power BI Designer from PowerBI.com, click the download button and then click Power BI Designer. If you want to use SQL to import the data, click ODBC Query. If you want to import one or more tables visually, using the Navigator dialog, click ODBC Tables. Note: Set "Provider=" to use the default .NET OLE DB Provider installed on your system. Click Refresh to synchronize your report with any changes to the data. 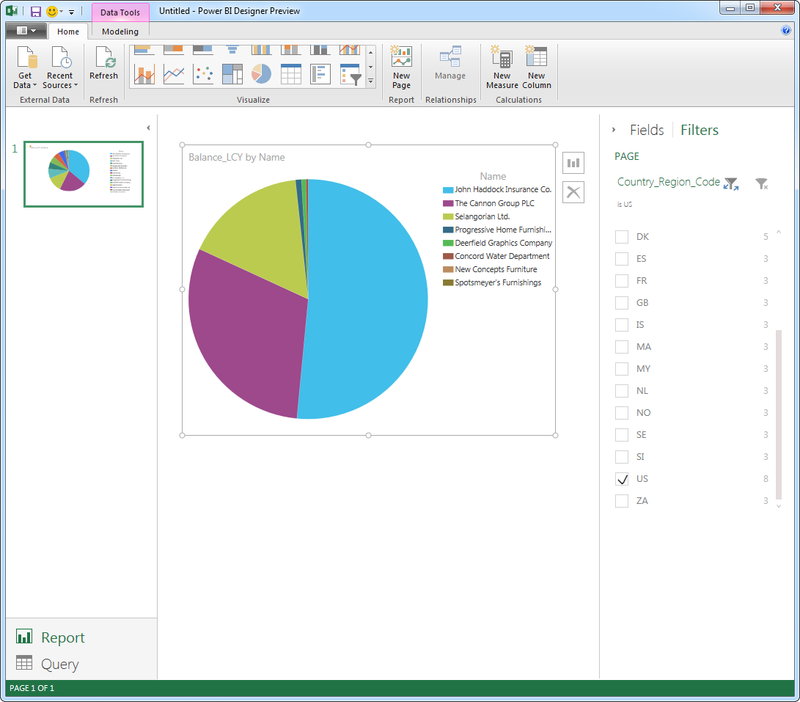 You can share reports based on ODBC data sources with other PowerBI users in your organization. To upload a dashboard or report, log into PowerBI.com, click Get Data -> Files, and navigate to a Power BI Designer file or Excel workbook. You can then view and edit the report in the Reports section. 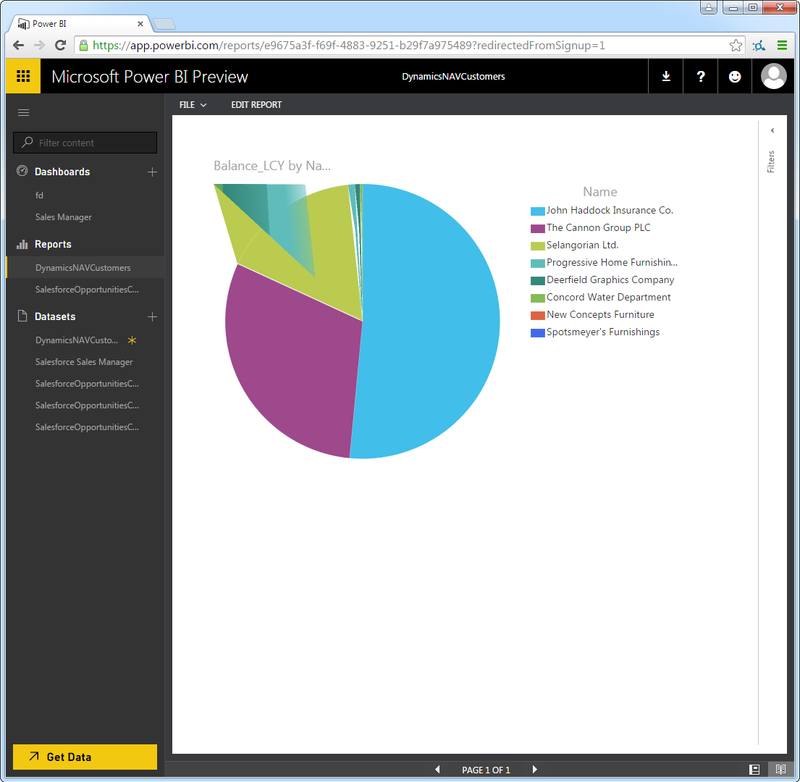 If you have not already done so, log into Power BI. In the Dataset section, right-click the Dynamics NAV Dataset. In the Settings section for your dataset, expand the Manage Data Sources node. In the ODBC section, click Edit. 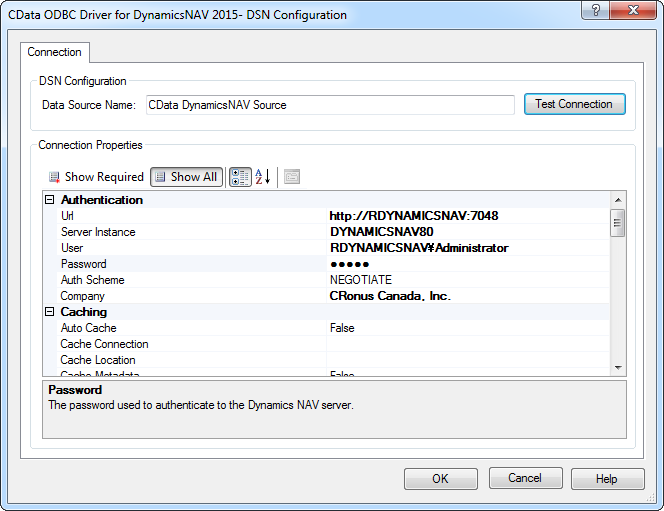 In the Authentication Method menu, select Anonymous, as your Dynamics NAV account credentials are already saved in the DSN. After configuring the Personal Gateway, you can refresh on demand and schedule refreshes. To schedule refreshes, expand the Schedule Refresh node and select Yes for the Keep Your Data Up-To-Date option. After specifying the refresh interval, click Apply. To refresh on demand, right-click the Dynamics NAV dataset in the Datasets section and click Refresh Now. Published at DZone with permission of Jerod Johnson , DZone MVB. See the original article here.